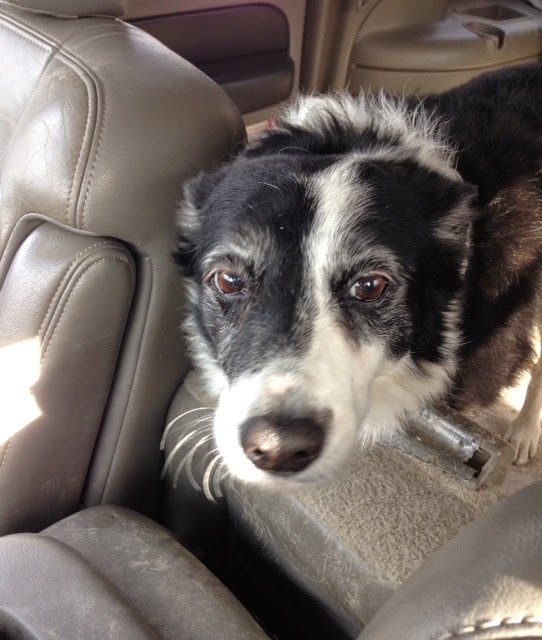 Usually once or more each week, one of the GHF staff members has to make a run to the vet. This could be for either routine procedures or for more serious or complicated surgeries, like Genie's recent surgery to repair her damaged legs. We have a local vet that we typically use for spays, neuters, dentals, and other common/basic surgeries. This also includes vaccines. If a dog, (like Genie) has a more complicated problem, the vet trip is usually much longer and can mean a drive to Cornell or a more specialized vet, capable of handling unusual or difficult cases. GHF has a vehicle on-hand to be ready for both emergency and run-of-the-mill vet runs. If it's something the on-site staff can't handle, off to the vet we go! Seen below are new girls Annie and Grace returning from basic dental procedures that they had done. They both rode well in the car and seemed to be happy to come back to GHF after being stuck at the vet! While the mission of GHF isn't to train dogs as perfect exemplars of obedience, some of the staff members do work with them in order to help burn off mental energy, make them think, and make them ready for their new forever homes! The 'work'/training we do with the dogs varies on what their needs are. Many of the dogs have worries about strangers and men so, when we can, since we have a staff of all women, we take advantage of male volunteers! 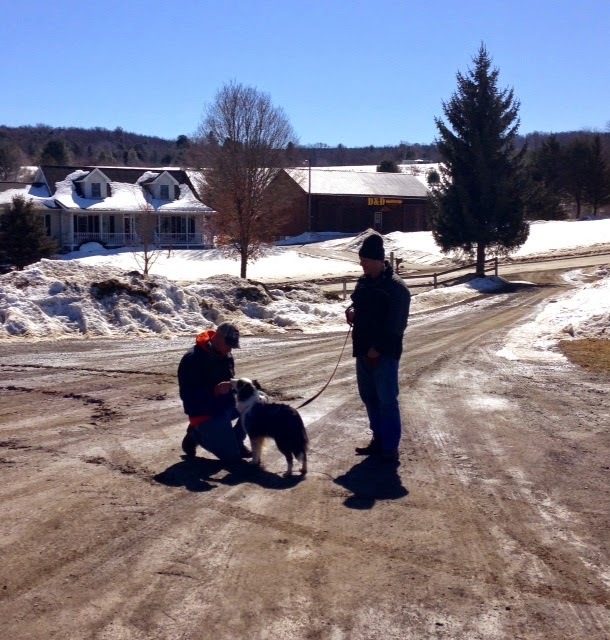 One of our volunteers, Jeff, is seen below helping with some of the training and socialization of two different dogs, Pip and Quincey. We have been working with Quincey on 'back up' since he at times feels protective over toys and high value items; Pip, on the other hand, is an ex-Sprakers dog and has fears with meeting new people. She is pictured in the pictures below working with one of our staff members and Jeff to have a calm and positive greeting in the parking lot. 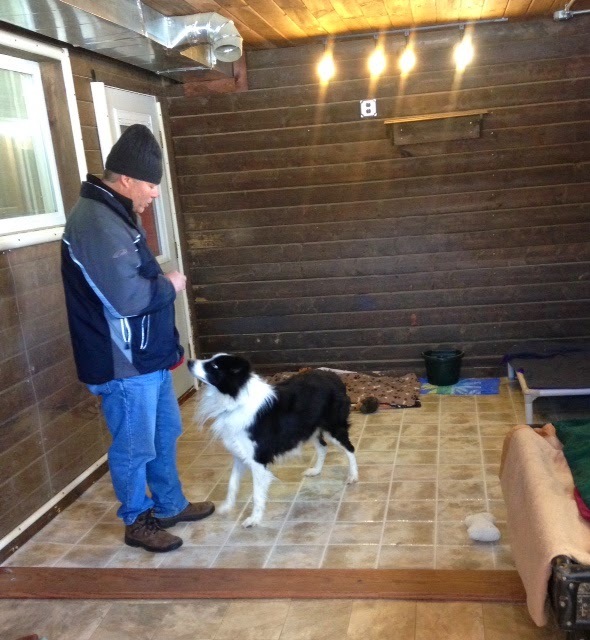 Quincey is pictured in his room working on basic obedience like down, sit, and back up, so he can engage meaningfully with a human being as well as learn when to hand over the toy to a human companion. It's all in a day's work here at GHF! There's certainly plenty of dogs to take care of at the Farm, with plenty of veterinary needs! Our trained and observant staff are prepared for emergency situations and all of them have lots of dog experience, vet tech and the like. GHF is also stocked with antibiotics, emergency equipment, GI meds, etc. If an emergency situation occurs, many times we can just handle it at the farm instead of driving all the way to the vet office! Here's an example of some of the 'med cards' we make up for the staff to follow... it helps to make sure that the dogs get the proper dose and that we can keep track of how long the dog(s) are on meds! The medial supplies have been redone recently and so now it's easy and simple for everyone to access the supplies and medicine... very quickly if need be! The medical supplies include needles for blood samples, ear and eye medicine, anti-coagulants to stop bleeding from minor wounds, antiseptic spray, pain relief meds, etc. We even have a microscope to test for parasites! The Farm is thoroughly prepared for any mishaps or accidents! This meme is very funny... however it also sheds (pun intended) light on why so many BCs end up in rescue. 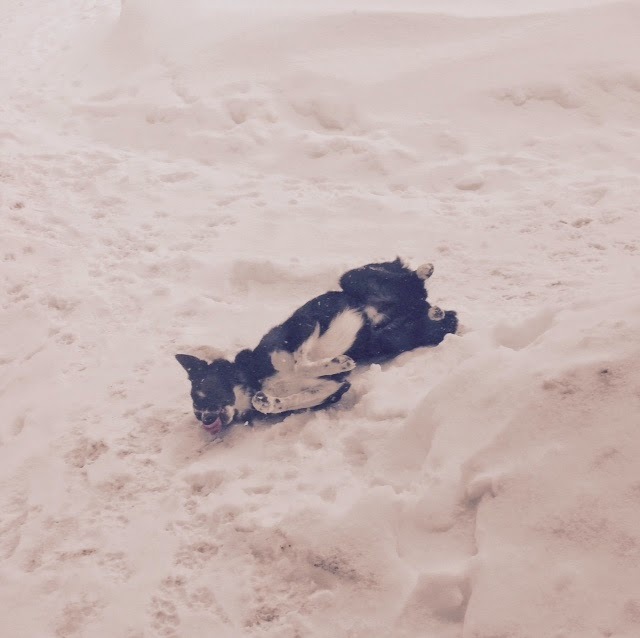 People are attracted to border collies because of their famous intellect, which, while certainly a true characteristic of the breed, is in many cases a downfall when they are placed in mainstream homes. People buy BC puppies for their intelligence... then quickly learn they are ill-suited to care for the dog's evolving and complex needs. Often, they are not good with children and exhibit herding behaviors towards them (such as nipping, etc.)... yet another reason why we see so many BCs. 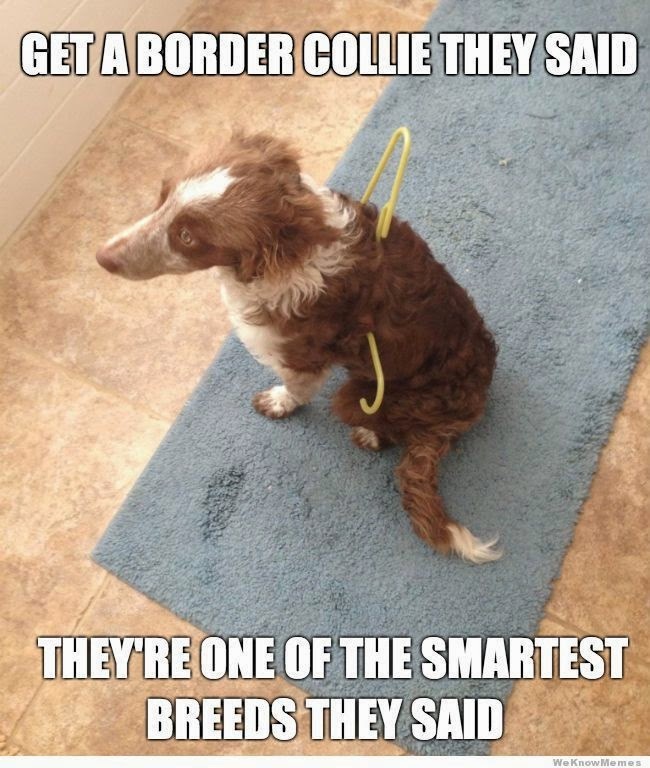 This image capitalizes on a popular meme in a humorous way, but it also epitomizes the sad truth of why border collies need rescue in the first place. Dog owners, do your research! although he wasn't thrilled about it, he certainly did well and he seems to like the after-effect of having a nice, unmatted coat! Jessie's coat was very dirty and so we had to give him two baths to try and get the stink and stain out. Poor Jessie lived much of his life chained up and finally ended up making his way to GHF. Jessie needs to have his teeth cleaned, to be neutered and to get some good nutrition in him, but we hope that with time (and with spring!) his spirits will brighten up quickly! His bath today with special shampoo and conditioner are all part of the process! 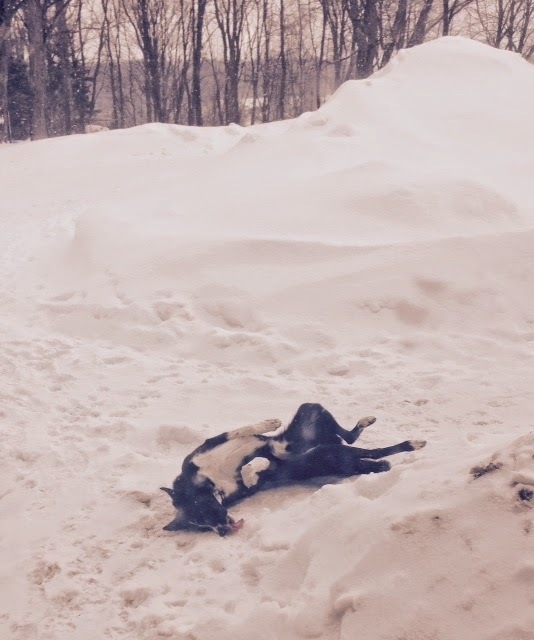 With all the cold (yep, still cold) weather we got last week, the dogs were dished out some nice, juicy knuckle bones to help combat the winter boredom! Glen Highland Farm, Inc is a 501c3 non-profit organization dedicated to the rescue of abandoned & unwanted border collies. View dogs available for adoption. 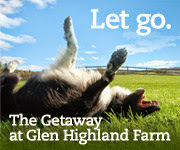 Vacation with your dog at GHF! © 2014 Glen Highland Farm. Powered by Blogger.